My 15 year old son has asperger’s. One thing about our awesome kids is that they tend to get stuck in their routines–now this isn’t a bad thing, routine is good for them, too. I tell you this because today is the first day back to school after the longest holiday break I can recall…EVER! If we didn’t have what my son needs to eat for breakfast on school mornings, there is no guarantee how his day may have gone. Waffles are amazing! We love carbs in my house, I wish we didn’t, but we do! Ryan has had waffles with peanut butter on them nearly every school morning for as long as he can remember. Mostly because it’s only recently that I’ve been able to get him to eat oatmeal & I don’t always have time to make eggs. My requirement has always been nut-butter. Pancakes or waffles are just cake, unless you add protein to them…then they become the conveyor in which the protein travels to your gob! Much like bread for tuna fish or chips for bean dip! Plus, there’s the rule of 3’s…a meal requires a minimum of 3 food groups, you add peanut butter to your waffle, then all you need to do is drink a glass of juice or milk & technically you can tell mom that you’re not breaking the “3 rule.” Less than 3 food groups is a snack, no matter how well intended, or which groups you choose. 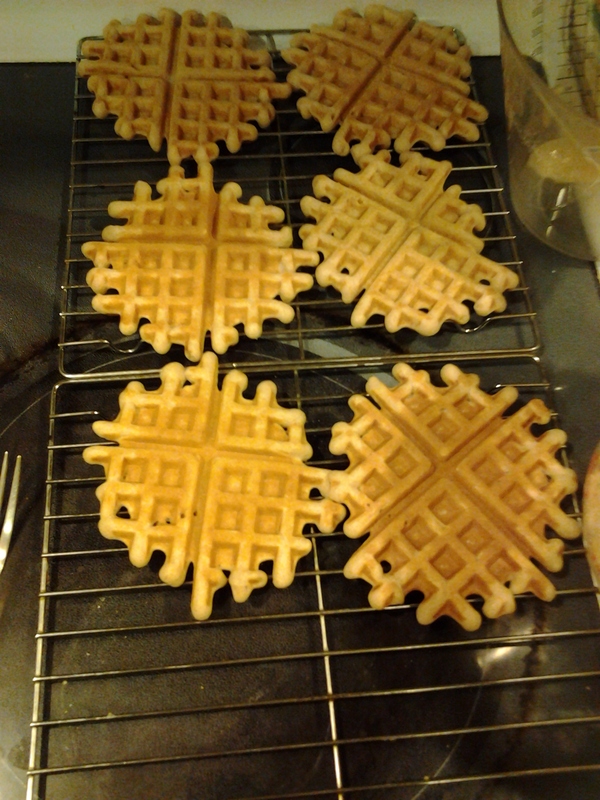 The problem with frozen waffles (which are super convenient) begins a few years before boys get into their tween years. They now eat a minimum of 2. If you’re buying “buttermilk” or “homestyle” (probably spending between $2-$3 a box unless they’re on sale) they are mostly fluff & not filling at all & the average boy in this age group could probably eat the whole box (of 8-12) if he was being honest with you. If you are buying the “natural” ones (probably closer to $4 for a box of 6-8 not on sale) they may or may not like the taste & because there are fewer in the box you will go through them faster, (It is also near impossible to find the “natural” brands in bulk stores, like Costco, in many areas, so you have no choice but to buy the small boxes. The other problem for a gal like me is all of the excess packaging. Luckily, the outer packaging is cardboard (for most brands) which is easy enough to recycle. However after living in NW Montana for 6 years, I am well aware that not everyone lives where recycling is easy to do. The bags inside the cardboard box, however, are often not marked, so most folks, including myself, don’t know, without a lot of research whether they can be recycled or not. My final issue was the space that the Costco-sized box of waffles was taking up in our freezer. (I don’t have a problem mentioning Costco by name in my blog, because I do most of our shopping there. They shouldn’t be upset that I no longer buy their waffles, they get plenty of our support.) 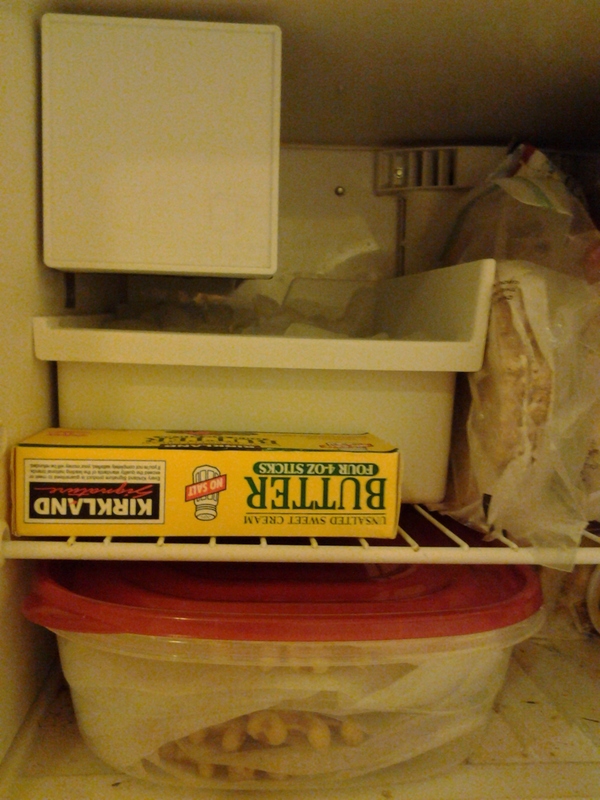 We don’t have a large freezer, we have a small chest freezer & a tiny freezer in the top of our refrigerator. Being able to save room in our freezer for meats, leftovers, soups, sauces, & some easy-to-heat stuff for the teens is much appreciated! 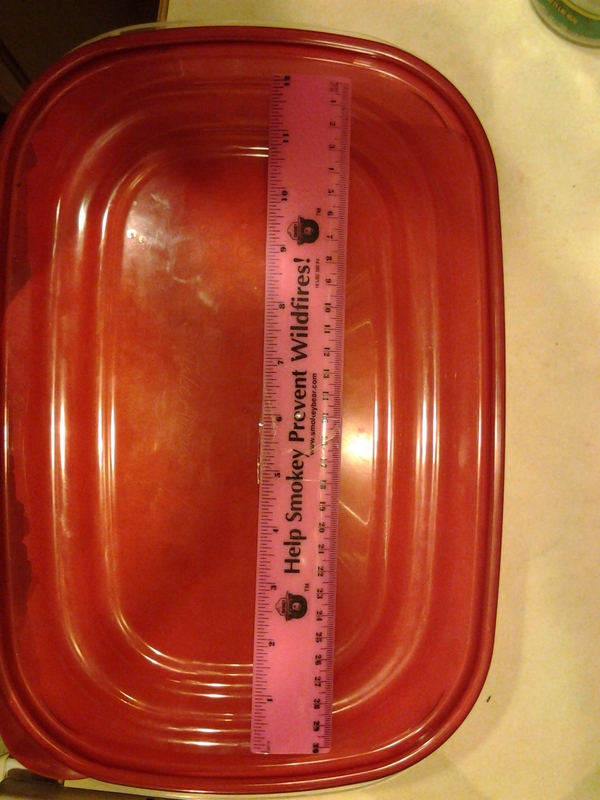 13″L x 7″W x 3″D Rubbermaid container fits perfectly in bottom of fridge! Above is my tiny fridge/freezer, well the leftmost 1/3 of it. The bottom shelf is between 3.5 & 4 inches high, so random little things end up down there like half bags of frozen berries & single popsicles that have lost their way. This box I found is PERFECT! It is a Rubbermaid brand & it said “freezer safe” on the packaging. It is a little more than 3-inches high, about 13-inches long (so I can still put a thing or two behind it if needed), & just over 7-inches across. It came in a 2-pack for less than $4, if I’m remembering correctly. The container being clear was important to me too so that at a glance I could peek in & see if we were getting low. One thing about my son, he announces that we’re “running low” of something when he’s leaving the last of something. So he should be saying “we’re out” not knowing if shopping is occurring that day…awesome. 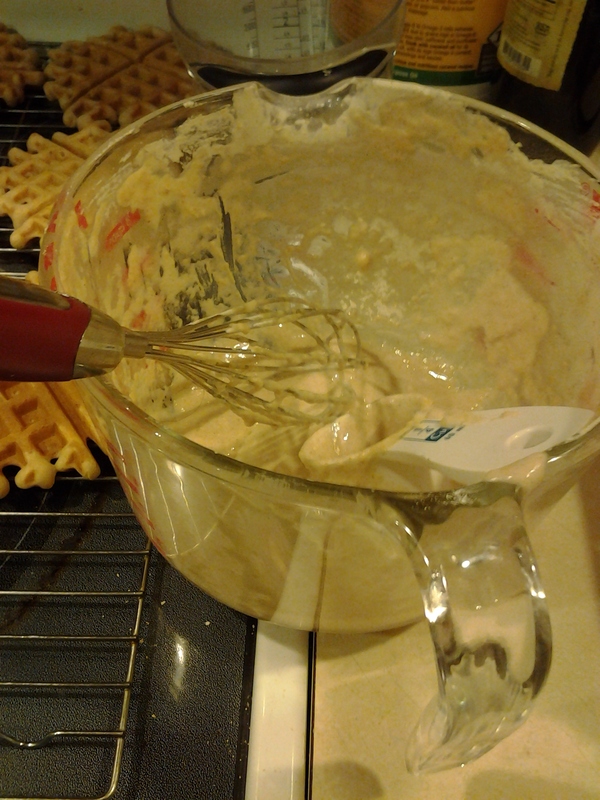 Begin with your favorite waffle mix. I usually use Krusteaz because it is so simple & I trust the ingredients. I have been hunting for a homemade mix recipe that doesn’t involve adding eggs. If anyone comes across something, I’m a fan of DIY when it comes to mixes and things, please pass it along! to save cleanup time, I use my 8-cup pyrex measuring cup to mix & scoop out of. No sense cleaning a bowl & measuring cup! 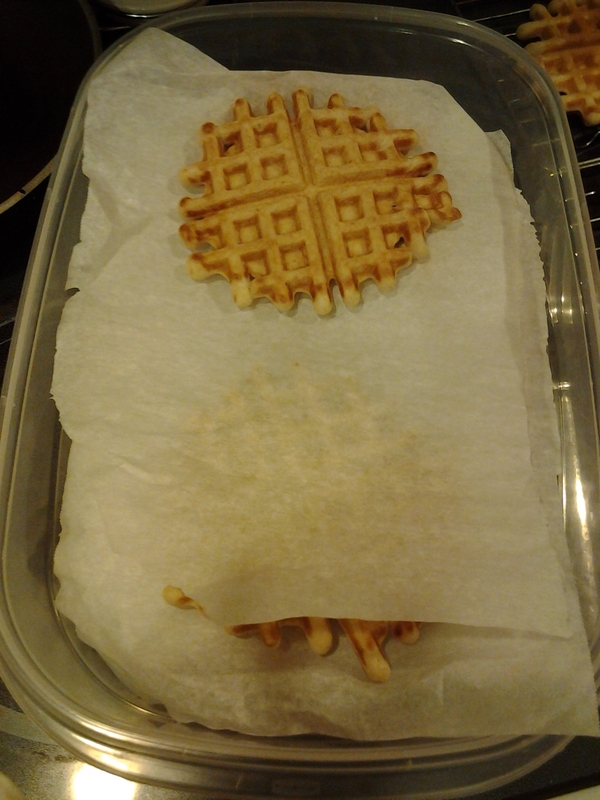 When you remove the waffles from the waffle iron, it is important that they cool completely before you put them in the container. Otherwise, the extra moisture in the container will cause freezer burn. If they are completely cooled, they won’t stick together & won’t have excess frost related issues while in the freezer. let them cool completely, on a rack, before putting them into the container. 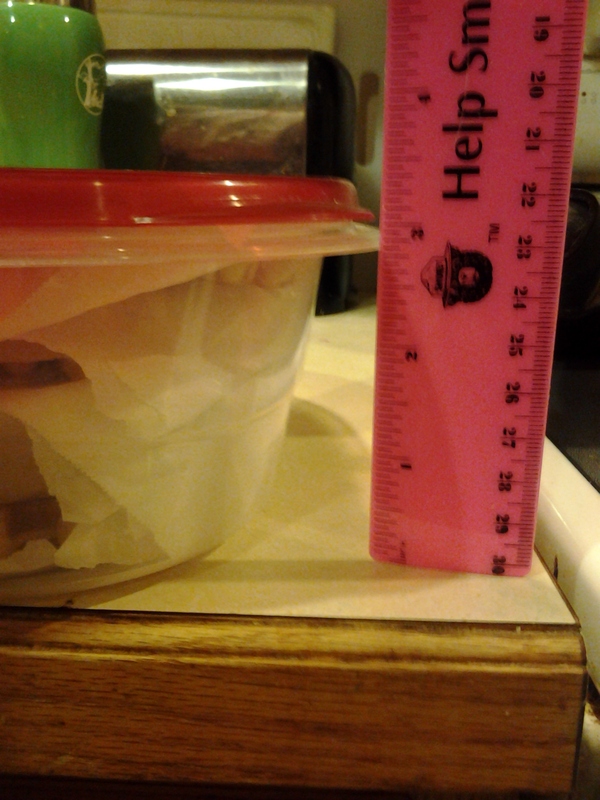 I put 2 per layer, with parchment paper in between. 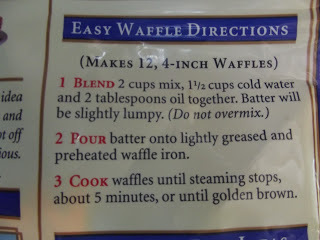 This makes about 25 waffles. 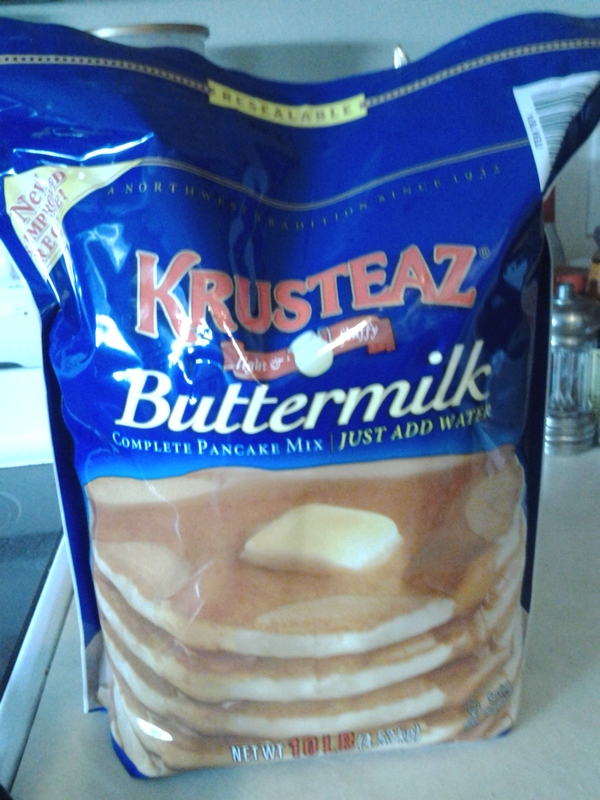 If you buy the Krusteaz bag (above) at Costco, it will cost you less than $6.00 & make you between 112 & 118 waffles or pancakes. That means that it costs around $0.18 per waffle, (That is assuming I did my math right, of course!) Only my 15yr old eats waffles, most days, & he only eats them on school days. 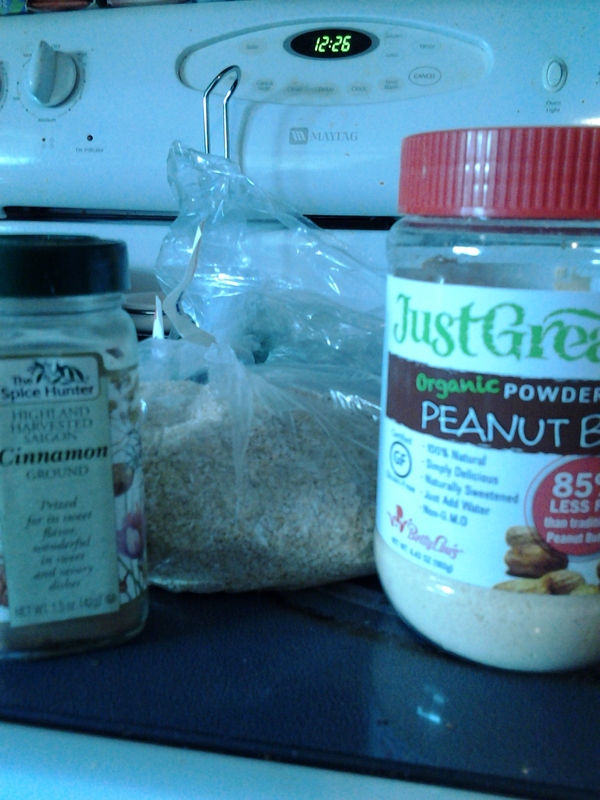 All of this considered, in about 40 minutes, for less than $6 (plus a little oat bran, a little cinnamon, & a little peanut butter powder), I made breakfast for my 15yr old for every school day from now until the end of the 1st week of February. Not bad for the 1st day back from a Holiday Break!